We provide free, no-obligation foundation repair quotes throughout our Texas service area, including Laredo, Victoria, San Antonio, the surrounding areas of New Braunfels, San Marcos, Eagle Pass, Del Rio, Seguin, Kerrville, Beeville, and nearby. Call or e-mail us today to schedule an appointment! At Foundation Supportworks, Inc., we recommend repairing damage done to your foundation by street creep with the GeoLock® Wall Anchor System. We Do Street Creep Repair In Texas! At Foundation Supportworks, Inc., we have warrantied solutions for repairing street creep damage to your foundation. To help you decide if our solutions are right for you, we offer free written street creep repair quotes throughout our TX service area. 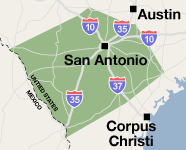 We serve the Victoria, San Antonio, Laredo, area, nearby areas such as New Braunfels, San Marcos, Eagle Pass, Del Rio, Seguin, Kerrville, Beeville, and the surrounding regions. To schedule an appointment, contact us by phone or e-mail today!